Built along Commonwealth Avenue adjacent to the Minnesota Steel Company complex in 1915, the Universal Portland Cement plant converted granulated slag — a byproduct of steel manufacturing — into cement. The operation employed between 350 and 400 workers who could produce up to 4,000 barrels of cement daily. 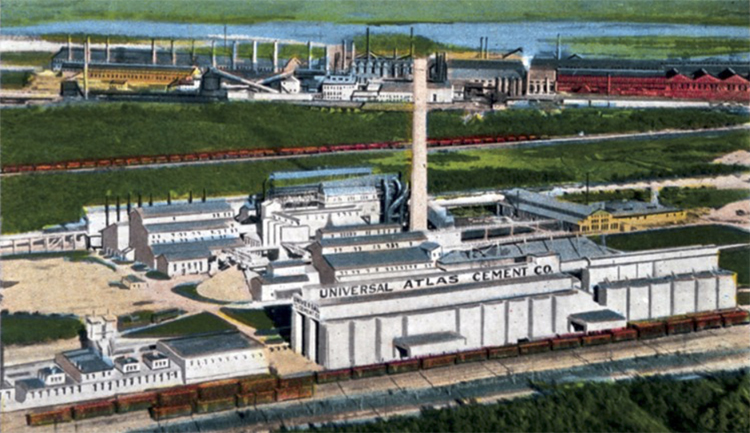 United States Steel opened a number of Universal Portland Cement plants across the country, next to wherever they operated a steel mill. The cement factory’s first client was its owner, United States Steel. The nearby “company town” of Morgan Park was created for U.S. Steel employees and named for the company’s founder, J. P. Morgan. Like the steel plant itself, nearly every building and home in Morgan Park was made of concrete block, so in 1915 when the steel plant began producing steel — and slag — Portland took over from other cement providers. 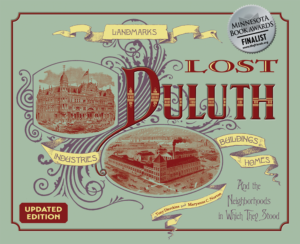 (The nearby neighborhoods of Gary and New Duluth were also populated by Minnesota Steel Company and Universal Portland Cement employees). In 1930 Universal Portland Cement merged with Universal Atlas Cement Company and assumed the latter company’s name. When the steel plant stopped producing steel — and slag — materials for cement production were shipped from Gary, Indiana, to the Duluth plant, which proved to be impractical. In 1976 the Minnesota Pollution Control Agency pressured the steel company to arrest air pollution caused by cement dust. The necessary conversion to the already outdated facility was deemed cost prohibitive, and the cement plant closed, taking two hundred jobs with it. The plant was demolished In 1978; Duluth’s Ikonics company now occupies forty acres of the site.